What’s the Cost to Install a Heat Pump in Phoenix, AZ? Heat pumps are an excellent alternative to an air conditioner/furnace combo if you live in the Phoenix area. But how much would a heat pump cost to install? Well, installing a heat pump in Phoenix costs anywhere from $1,800 to $10,000 with the average cost being around $5,500. Okay. That’s a pretty broad range of numbers, we know. But asking how much a heat pump installation costs is like asking how much a house costs. It really depends on various factors, right? So, let’s take a look at 4 factors that affect the price of an air source heat pump installation. Ready for specific pricing? Just contact us for an estimate. We’ll send over an experienced Phoenix tech immediately. Summary: The larger the size of your heat pump unit, the more expensive it is. Just like the cost of a house depends on the square footage, the size of your heat pump dictates how much you’ll pay for the installation. But, unlike buying a home, you don’t have a choice in what size heat pump you get. The heat pump size your home needs is based on a professional calculation called a Manual J Calculation. Proper sizing is important because going too big or too low in size costs you a lot of money in monthly heating bills, shortens the unit’s lifespan, and decreases your comfort. Moral of the story: Beware contractors who don’t perform a Manual J and “guess” what size unit you need just by looking at your home’s square footage. Heat pumps are sized in tonnage or “tons”. Residential heat pumps range from 1-ton to 5-ton units. But that doesn’t refer to the actual weight of the unit. Instead, it refers to the amount of heating or cooling it provides in a certain time. 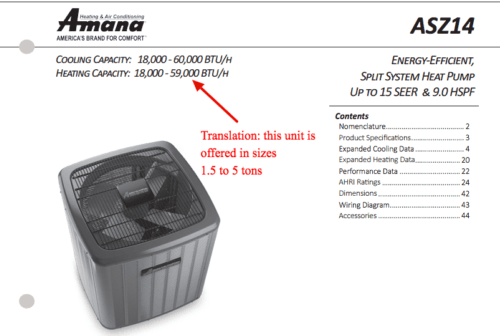 Tip: Sometimes, manufacturers will size their units in “BTUs” (a unit of measurement for energy). In order to convert BTU’s into tons, divide the BTU’s by 12,000. Summary: The more energy efficient the unit, the more it will cost. 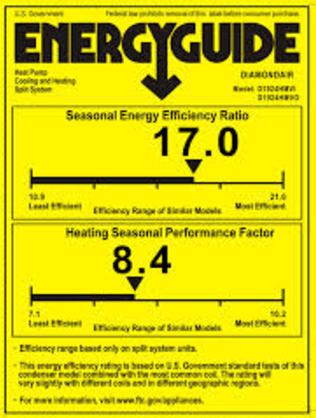 But high efficiency units also save you more every month in lower energy bills. Those acronyms basically tell you how energy-efficient a heat pump unit is compared to others. Higher efficiency ratings means lower operating costs. The HSPF (Heating Season Performance Factor) of your unit measures how efficient the unit is at heating your home. Currently, the minimum HSPF you can purchase is 7.7 but ratings go all the way up to 13+. Summary: Typically, the bigger the brand, the higher the cost of the unit. Choose a brand that offers the best warranty. Just like clothes, bigger, more popular HVAC brands come with bigger prices. But when it comes to popular HVAC equipment there’s little difference between the equipment. So, instead of choosing equipment based on a brand, choose a brand according to who offers the best warranties. Typically, manufacturers offer anywhere from 1-10 years for a parts warranty, 2-10 years for compressor warranty and 1-5 years labor warranty. Sometimes, manufacturers offer the option to extend these warranties but that will push the unit price up. Summary: In general, higher quality contractors come with higher installation costs. Okay, so we saved the most important factor for last. The contractor you choose has direct influence over your overall satisfaction with your heat pump. A sloppy, quick job can shorten the life of your heat pump and leave you with high repair bills later on down the road. So how do you protect yourself from inexperienced, sloppy techs? If you live in the Phoenix area and need an estimate on a heat pump installation, we’re here for you. Just contact us today to set up your free estimate. We provide same-day service. How Much Does It Cost to Install a Furnace in Phoenix?